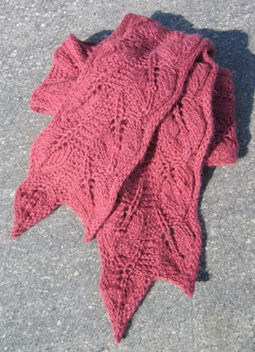 I first noticed this scarf from the needles of the ultra-talented Annie Modesitt when I borrowed Scarf Style from the library. 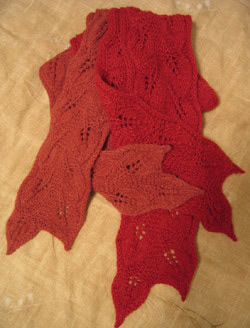 The design didn’t fully sink in until I saw a sample of this scarf actually knit up at a local yarn store. Then I knew I had to have it! I’ve noticed that everyone who’s made or is making this scarf has chosen to make it in green. Ha! It screamed “pink,” “rose,” and “red” to me as soon as I saw it! 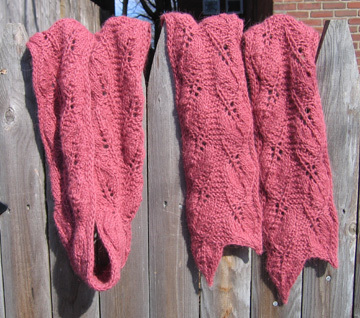 I ended up making two Backyard Leaves scarves, both out of elann’s 100% Peruvian Collection Alpaca. I really enjoyed using this yarn, it’s very silky and smooth, with just enough fuzz. 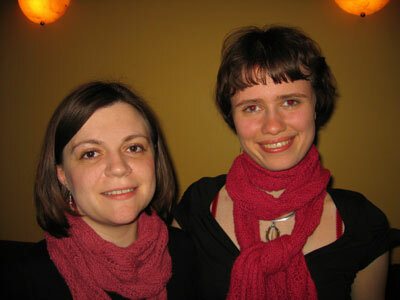 I kept the first scarf in antique rose for myself, and the second scarf in raspberry was a birthday gift for my friend Egle. 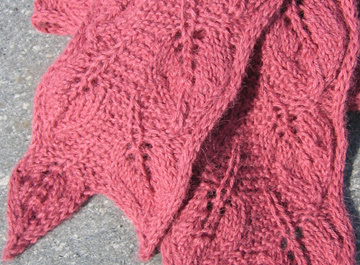 there’s any way to completely memorize the pattern, even after much knitting, because it’s a 28-row repeat. Overall, I’m very satisfied with this project. Annie’s design is just brilliant!